Bali has various types of furnished accommodation, cheap hotels to luxurious and expensive. 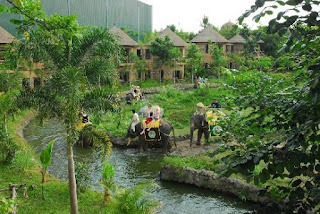 Hotels in Bali also has a lot of variety, uniqueness, and furnished according to the needs of guests. There are hundreds of hotels in Bali with cheap prices and can provide service and convenience for hotel guests. Kuta is an area with many cheap hotels. Kuta Beach into the shaft in hotel construction in Bali. Not just a cheap hotel in Bali also has a unique and attractive design. 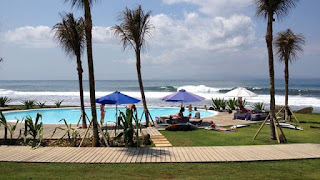 But not with the hotel around Kuta Beach who prefers a number of rooms at a bargain price. Unique Hotel will give guests a different experience while staying the hotel room, while on holiday in Bali. Design hotels in Bali is quite a lot. Can be selected in accordance with the wishes. Design hotels in Bali is made with a different concept than usual and can give the sensation of staying hotel guests. Bali holidays will feel different if staying at the hotel deng unique and exciting concept. Here are four unique hotels in Bali that can provide different sensations while on holiday in Bali. Between the two islands of Nusa Lembongan and Nusa Penida, an island with the name of Ceningan. The island is small, Ceningan island area is 300.6 ha. 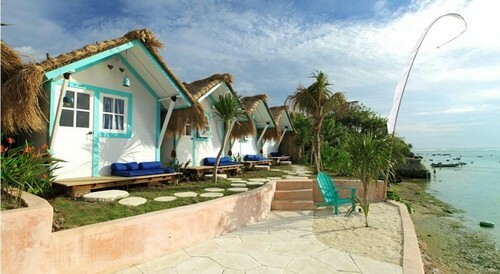 One of the most unique hotels in Ceningan is Le Pirate Beach Club. There are 10 rooms in this unique hotel, which is 2 Bunk Bed room type, 8 room types Beach Box. Bunk Bed room contains 4 single beds that can be filled 4 people. Meanwhile Beach Box contains one double bed. What is unique here is the inn with modern facilities but clad young and fresh concepts, remained with the nuances of local wisdom. Le Pirate Beach Club has service casual lifestyle, music up to date, but still offer local knowledge. NusaCeningan famous for seaweed cultivation. Guests staying at the Le Pirate Beach Club can participate in the activities of planting or harvesting seaweed. If you want to stay at this unique hotel, should have booked a room in advance, because the number of rooms was very little, and you get a chance very little room. 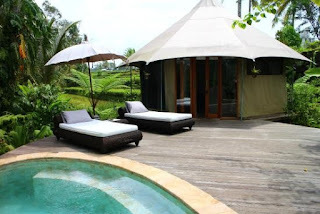 Design hotels in Bali with the theme of the tent. Not just a tent, because the tent shown impression is very glamorous and festive. This unique hotel in Ubud, Gianyar. This unique hotel is located at Jl Subak Sala, Banjar Sala, Pejeng Kawan, Ubud. There are five rooms in a tent and three rooms in a granary that can be selected. Tents at this unique hotel there are manifold Suite and Luxury. Because of tents, then there is no wall in this room type. But the furniture in it was very glamorous. While the room is a barn-type building made of bamboo epic. As philosophy barns, room type is also shaped house on stilts. So it is very unique and can provide different sensations while on holiday in Bali. If you want a room with a view of the wild, can book a room types is Swala fillable 2 adults and 1 infant. Whereas if you want a family room can choose the room types is Kivaru and Tembo. Swala through room types, guests could see herbivorous animals such as rhinos and zebras. While in the room types and Tembo Kivaru can get the service shocking, was picked up by riding an elephant at breakfast. For one night, the rooms Swala priced at Rp 2800000 per night. While Kivaru room is Rp 5500000 per night, could be for four adults, and Tembo worth USD 7400000 per night, can be for 6 adults. 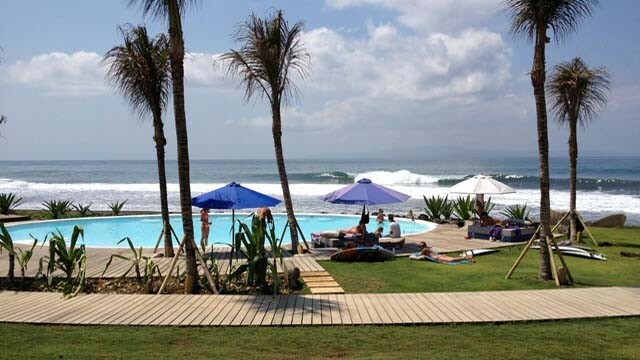 Komune Resort & Beach Club is situated at Keramas Beach in Gianyar, Bali. This inn is for the surfer. But the concept is really unique so that anyone would be interested in staying here. There are 2 types of rooms available at the inn is Suite Room and Standard Room. Total room is 66. As other lodging for the surfer, the location of this resort is located right on the waterfront. So guests who stay can sunbathe while watching surfers play with the waves. With the majority of the colors blue and white, this resort looks so united with the existing landscape. The most fun, swimming in the pool while enjoying the scenery around. For a one-bedroom suite per night is US Rp. 2100000, and the standard room is Rp 1400000 per night. Hotel Unique is very expensive. Unlike in Kuta, Nusa Dua, Sanur. Unique hotel prefers a different experience to the guests while staying. That led to a unique hotel to be very expensive. Sensation for guests take precedence over price. If you want to get a cheaper hotel, then go to Kuta or Sanur. In the region is very much a cheap hotel with mediocre service.